ZTEC-E microelectronics grade cartridges represent Graver’s latest development in ultrapure water filtration technology. 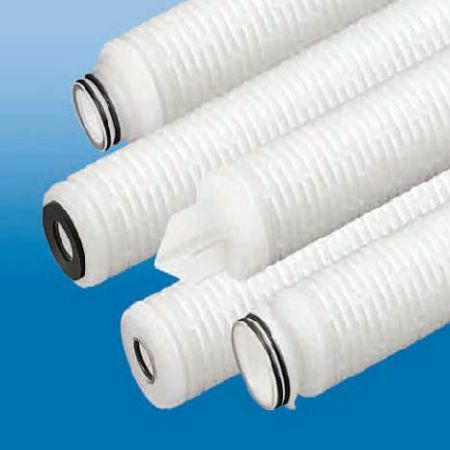 The filters are inherently hydrophilic and contain no added surfactants or wetting agents that could contaminate pure and ultrapure water streams. The PES membrane offers superior flow characteristics, high contaminant capacity and consistent removal of sub-micron particles. The cartridges exhibit rapid rinse-up to 18 MW-cm resistivity and single digit ppb levels of TOC. •Manufactured, flushed, tested and packaged, in an ISO Class 7 Cleanroom Environment. •Filters are100% flushed with 18 MW-cm DI water and integrity tested. •Resistivity rinse-up to 18 MW-cm and single digit ppb TOC levels with minimal throughput. •Available in a variety of end cap/adapter configurations to fit all industry-standard housings. •Pore size, lot and serial number are stamped on each filter element for identification and traceability.